Is Labour A Campaigning Party? I had the pleasure of working with Deborah Mattinson during the 1987 and 1992 election campaigns when she undertook qualitative polling for the Labour Party. She was expert in interpreting what could be gleaned from focus groups, and those running the campaign, myself included, always listened attentively to what she had to say. Politicians always listen carefully to what the pollsters tell them; indeed, it could argued that they are inclined to pay too much attention to poll findings, particularly in the middle of election campaigns when the apparent precision of the figures (if not of the facts behind them) can seem to be the only certain element in an uncertain world. The problem for both politicians and pollsters, however, is that – even if the pollsters can accurately report what the voters are thinking (and they usually make a pretty good fist of that) – it is not at all clear what lessons should be drawn from that by the politicians. The pollsters’ message may seem clear. They may report, for example, that the voters see the party as strong on issue X and weak on issue Y – but does that mean that the politicians should concentrate on issue X, to maximise their advantage, or should they make some effort to minimise or negate the handicap on issue Y? And if the latter, does that mean that they should change policy to align more closely with the voters’ perceptions or should they make a greater effort to persuade the voters of the merits of their policy on issue Y? Much will depend on when, during the electoral cycle, the poll findings are reported. With a year or two to go, a change of policy or an increased effort to change public opinion on a given issue may make sense. But those are less sensible options during the campaign itself. What all this means is that we should have no difficulty in accepting Deborah Mattinson’s assertions that Labour lost the last election because it was not trusted on the economy and did not do enough to change voter perceptions that the responsibility for the Global Financial Crisis should be laid at Labour’s door. The poll findings are all too clear. The difficult part of the argument, however, is what should be Labour’s response to those factors? Should they concede management of the economy as territory inevitably held by their opponents, make no effort to counteract the false charge that they created the GFC, and concentrate instead on social and environmental issues that offer more promising terrain, which is roughly where the 2015 campaign ended up? Or do they face up to their problem (and the centrality of the economy as an issue in the minds of many voters) by either changing policy or the voters’ minds? The pollsters’ answer to such questions is almost always the same; poll-driven politics seem to dictate that it is policy that must adapt to voters’ opinions, and not the other way round. That is why many in the Labour party will urge that, far from challenging Tory economic policy, the only path to electoral salvation lies in developing policy that looks more and more like current right-wing orthodoxy. But that response is open to serious objection. A pale imitation will almost always be rejected in favour of the real thing. Why should the voters go for “Tory-lite” when it can only be seen as a reluctant and therefore unconvincing confirmation that no real alternative is available. Even more seriously, where does that leave the whole thrust and purpose of left-of-centre politics? What would those who championed social justice, workers’ rights, full employment, public services have achieved if they had forsworn any attempt to change opinion? Is it not the role of those who believe that a better society is possible to challenge and change opinion and to do so by argument, debate and campaigning? The pollsters’ message is in danger, in other words, of disabling any real attempt to bring about overdue change. And nowhere is this more urgently needed than in the management of the economy. If we want a healthier society and a more inclusive economy, a proper role for government, and a reversal of growing inequality, then we must argue for them and show how they can be achieved. That is not a hopeless task. But it cannot be achieved if it is never attempted. The voters will never accept that what see today is not the best we can expect if they are never told anything different. And it is not as though the time is not propitious. 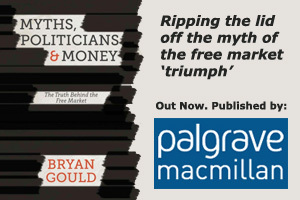 There is a growing body of expert and informed opinion that is clear that government can and should play a role other than simply imposing austerity, that inequality is the sign of a malfunctioning economy, that full employment is both desirable and achievable, that the deficit that really counts is not the government’s but the country’s. How sad if Labour’s courage should fail it, so that it lags behind progressive opinion, just as a new mainstream is developing. A campaigning party has four years in which to persuade public opinion that their lives can be better than they are now. They should go to it. hi sir.are you the same Bryan Gould who hd left uk labour party a long time ago and hd gone to New Zealand to teach ? Keir Hardie, who inaugurated the British Labour Party in 1893 and witnessed its successes in Parliament before he died, used to tell his followers, “What you must remember about opinion surveys is this. They are manufactured articles, shaped by vested interests and the press. Since they are only manufactured, they can always be changed.” If Hardie had accepted the opinion polls of his day, which overwhelmingly reflected the general view that women and workers lacked the intelligence and education ever to be elected to Parliament, there would never have been a Labour Party.